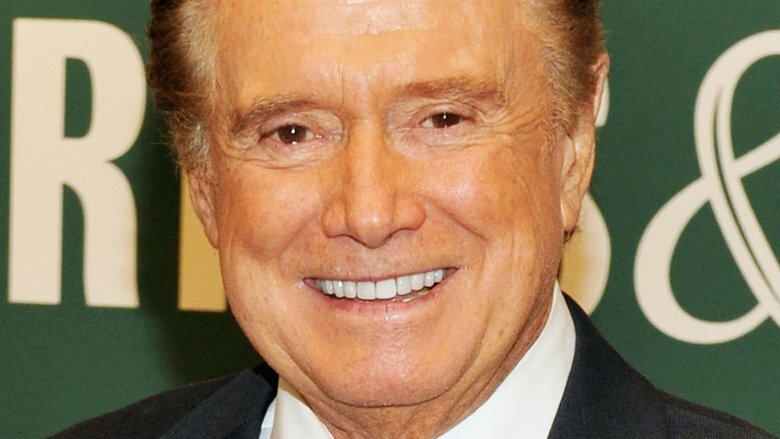 Regis Philbin earned his "hardest working man in show business" nickname for good reason. Over the course of his more than five-decade career, this multi-talent went from NBC page to bona fide TV legend. His most popular on-screen hosting credits include Who Wants to Be a Millionaire, America's Got Talent, and, of course, a nearly 30-year run on Live. In addition to holding the Guinness World Record for the most hours on television, he's also earned several accolades for his work, including multiple Daytime Emmy Awards, an induction into the Television Academy Hall of Fame, and a star on the Hollywood Walk of Fame. When the seemingly irreplaceable talk show host left Live with Regis and Kelly in 2011, he undeniably left a major hole on the small screen. Philbin was on the verge of turning 80 years old at the time, but didn't show any signs of slowing down in showbiz. However, he's been pretty quiet in the years since. From high-profile health issues and behind-the-scenes drama to spending quality time with his family, here's why you don't hear much from Regis Philbin anymore. 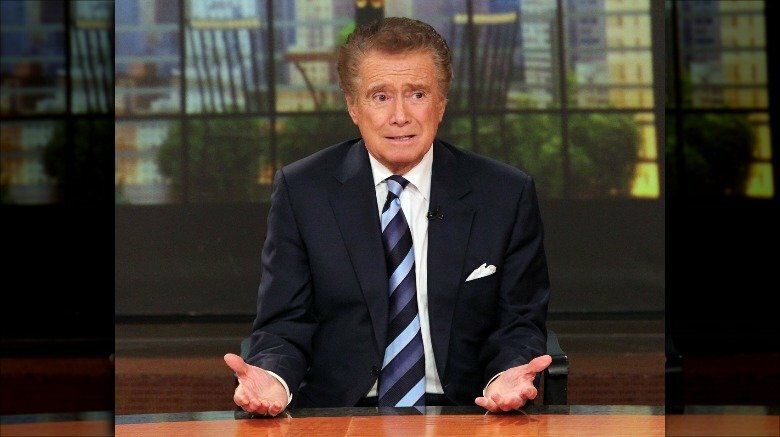 Following a 28-year run, Philbin announced his surprising retirement from Live with Regis and Kelly in January 2011. "This will be my last year on this show," he said during an episode of the popular morning talk show, according to ABC News. Calling it "the biggest thrill of [his] life," he went on to quip, "There is a time that everything must come to an end for certain people on camera, especially certain old people." That November, Philbin completed one of the longest-running hosting gigs in television history and marked a true end of an era. During his understandably emotional final episode, the TV veteran told the audience (via People), "I wanted this to be a show where people would feel better about themselves, would look at life in maybe a different way, a funnier way. I think that's what we've accomplished." He added, "I'm going out a pretty proud and happy guy." 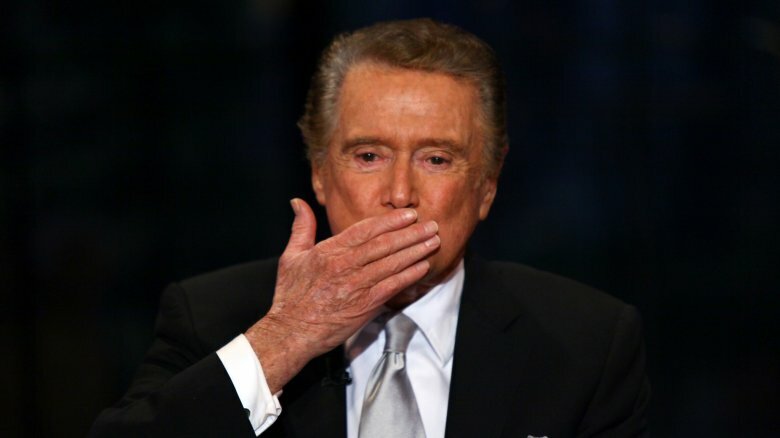 Due to some confusion over Regis Philbin's retirement announcement, his future plans in Hollywood remained uncertain following his heartfelt sign-off on Live. "I'm moving on," he clarified to NPR's Fresh Air around that time, adding, "I guess I wasn't clear. If people think you're leaving a show after all these years, you might be retiring. So I understand where they're coming from, but I should have impressed the fact that I hope I'm just moving on right now." Of course, former Live co-host and longtime friend Kathie Lee Gifford understood Philbin's retirement intentions from the start. "I'm thrilled for Regis," she told Access Hollywood (via ABC News). "Although he'll never retire, I think his most enjoyable days are ahead of him and I hope I'm a part of them." She added, "There's a million things Reg can do, there are going to be tons and tons of offers for him. He's still hot as pistol! How many people — except for Betty White — can say that in their '80s?" Indeed! Regis Philbin has long maintained that he left Live of his own accord. However, Howard Stern has a much more depressing theory regarding the matter. "The only reason he doesn't have a show is because he got old," the shock jock said on The Howard Stern Show in 2018 (via Radar Online). "I don't care how many press releases Disney or ABC put out, but he definitely aged out. No one wants to talk about that. And they pushed him out of the tribe. It was his show!" Yikes! It's no secret that Hollywood has a problem with ageism, but we'd like to hope this wasn't the case with Philbin. While he previously shot down Stern's other claims that he'd been fired from Live back in 2011, Philbin later told Larry King, rather bluntly: "Never once did they ask me to go back." However, People noted that Philbin did return for Live's Halloween episode in 2015, with the show supposedly extending an ongoing open invitation. Perhaps age really is just a number to some in Tinseltown. 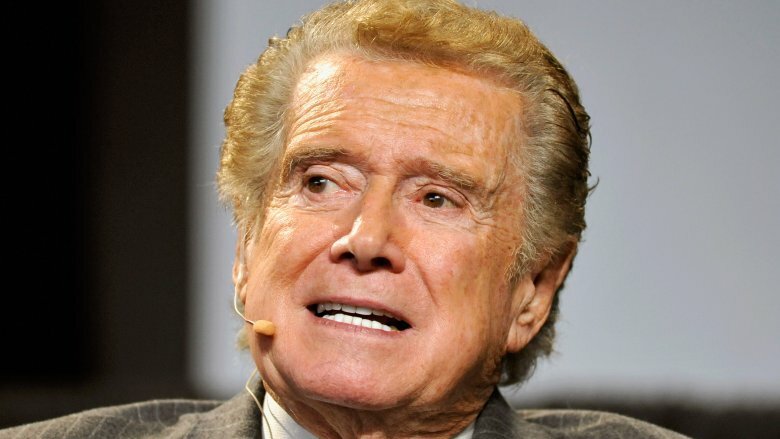 Regis Philbin has been battling heart disease for nearly three decades, which led to triple bypass surgery in 2007 (via ABC News). Between his healthy diet, exercise regimen, and cholesterol medication, the TV star's health has remained a top priority. "The experience made me realize I needed to take my heart health seriously," Philbin told AOL Entertainment in 2018. At the time, the outspoken healthcare advocate had teamed up with the American Academy of Family Physicians and Kowa Pharmaceuticals' Take Cholesterol To Heart campaign to raise awareness about heart disease treatments. "I joined the campaign because getting my heart health back on track has made all the difference in my life, and I truly hope others will join me in doing the same," he said. "In addition to my career accomplishments and incredible experiences along the way, I'm proud to include this campaign as part of my legacy." As a loving husband, father, and grandfather, Regis Philbin's new normal in his post-Live career has meant slowing things down in order to spend quality time with his family. According to ABC News, he and his interior decorator wife, Joy Philbin, welcomed daughters Joanna and J.J. after tying the knot in 1970. The television personality also shares daughter Amy and late son Daniel with ex-wife Kay Faylan. "I had a great run with Live and was fortunate to retire on a high note with a lot of support from the show and from fans," Philbin told AOL Entertainment in 2018. "While there are days I do miss working, it's been a nice change of pace to focus more on relaxing and spending time with my wife Joy and our kids and grandkids." Around that time, the TV star told Parade, "Our two daughters live in California, so Joy and I often travel between coasts to see them." After working together for more than a decade on Live, plenty of reports claim Regis Philbin and Kelly Ripa have a strained relationship and have feud behind the scenes. All that alleged dirt was apparently swept under the rug for the cameras because the duo shared an emotional exchange during Philbin's final episode. "Every morning, I'll think about this," he told Ripa at the time, per People. She tearfully replied, "Thank you for everything. I love you." However, when asked in 2017 if the two had kept in touch, Philbin told Larry King Now, "Not really, no." Philbin claimed the former soap opera star took his departure from the show personally. "She got very offended when I left. She thought I was leaving because of her … I was leaving because I was getting older and that wasn't right for me anymore." For her part, Ripa tends to not mention Philbin publicly, but she previously hinted that they were no longer on speaking terms in 2013, telling The Hollywood Reporter, "I haven't seen him, no." 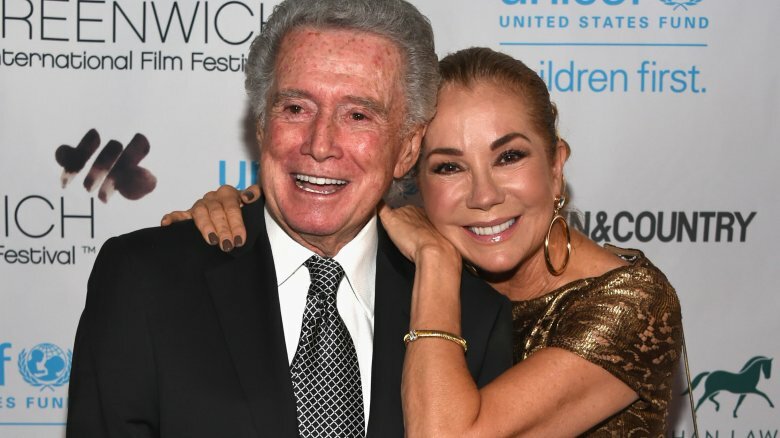 While Regis Philbin and Kelly Ripa may have parted ways both personally and professionally, he and former Live co-host Kathie Lee Gifford are still good friends. In addition to reuniting on the Today show in 2017 and being spotted grabbing dinner together in West Hollywood, these two are known to sing one another's praises in the press. "He's everyman to so many people," Gifford said in 2011, per the Los Angeles Times. She added, "Nobody tells a story like Reeg does." For his part, Philbin returned the love when Gifford left the Today show in 2019. Perhaps adding insult to injury to Ripa, Philbin candidly recalled working with Gifford during an emotional goodbye message to his pal. "Kathie Lee, you want to know the best part of … my TV life? Was in the 15 years I spent with you, from 1985 to 2000," Philbin said, adding, "We stayed friends through the entire game and it was a lot of fun." 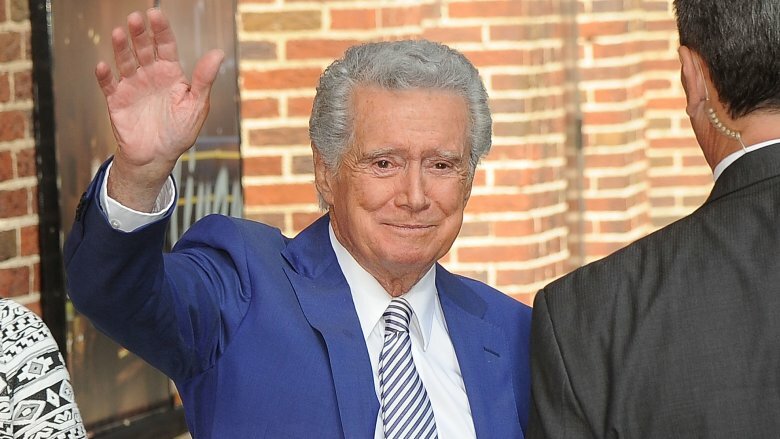 Regis Philbin was hit with two nasty rumors about his family and health in 2018. 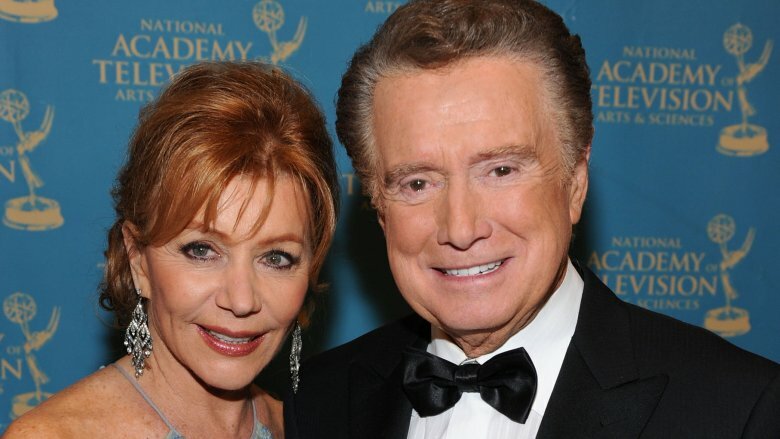 That April, his ex-wife, Judy Philbin, accused Regis of abandoning their two children — Amy and Daniel, who reportedly passed away in November 2014 at the age of 49 — after he remarried Joy Philbin. "They're evil. What Joy and him did to those two kids because they were not her children was despicable!" she told Radar Online. Judy claimed that Daniel, who reportedly had both of his legs amputated due to a spinal cord birth defect, struggled with depression. "They never bonded. He never came to visit us," she said. 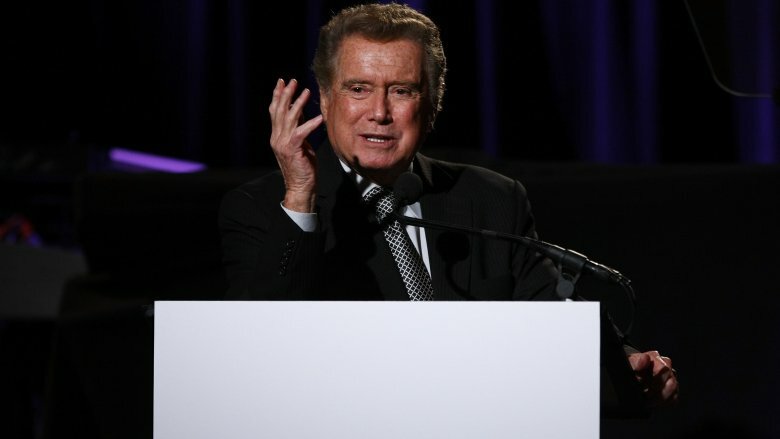 The National Enquirer claimed Regis' health had deteriorated as he reeled from the disparaging allegations. "Regis desperately wants to make amends and heal all the wounds before he goes," a source told the gossip rag. "He especially wants to clear the air with Kelly [Ripa] and extend an olive branch to his daughter-in-law!" At the time of this writing, Philbin has not publicly commented on these reports. While they say there's no such thing as bad publicity, we can't help but wonder if that's actually true. Throughout the 2010s, Regis Philbin has picked up a number of on-screen gigs. In addition to guest-starring stints on shows such as Hot in Cleveland, New Girl, and Matthew Perry's The Odd Couple, he's landed occasional guest-hosting work on the likes of The Late Late Show with Craig Ferguson, Fox Sports' Crowd Goes Wild, the Hallmark Channel's Home & Family, and Today. Between 2012 and 2017, he also appeared on Rachael Ray as a special guest. However, Philbin was quick to distance himself from assumptions that he planned to follow up his Live run with another co-hosting job, telling USA Today, "I'm just a guy showing up on her show once a month." Despite continuing to work as both an actor and host in Hollywood, this scattered line-up of projects has done little to increase Philbin's presence in TV. As of this writing, he has yet to land a steady on-screen job, perhaps by design. Regis Philbin's career has undeniably slowed down since he left Live with Regis and Kelly in 2011. At the time of this writing, the TV veteran hasn't officially announced any upcoming projects. However, according to the rumor mill, he's reportedly gunning to reunite with Kathie Lee Gifford. 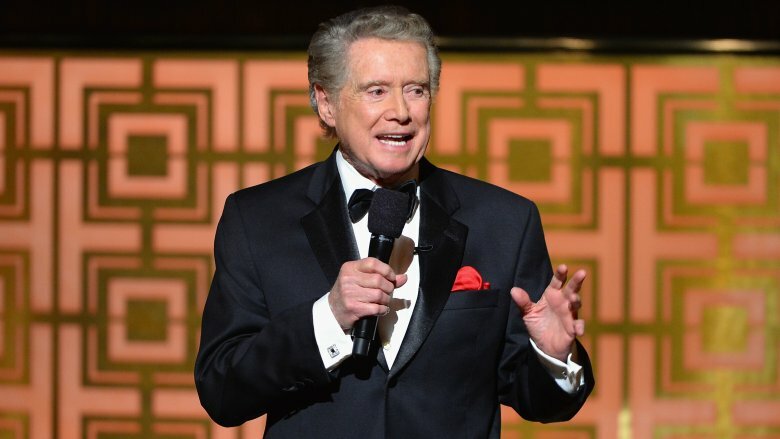 "Things haven't been great for Regis since then, and he believes Kathie Lee is his ticket back into the spotlight," a source told Radar Online in early 2019. "Regis is begging Kathie Lee to go out on the road with him and play theaters and casinos … He's itching to get back in the game." While it's unknown whether there's any truth to this report, fans of Philbin might take solace in the fact that the Hollywood honcho seems perfectly happy living a much more low-key lifestyle, both personally and professionally. Outside of the hustle and bustle of showbiz, it looks as though this multi-talent will continue to take on work sporadically while enjoying time with his loved ones and keeping himself in tip-top shape. Ultimately, Philbin seems to be taking on Hollywood on his own terms, and far be it for us to argue with that tactic.